Fireball Orange, Airbrush Lexan Paint, 2 fl oz. Fireball Orange, Airbrush Lexan Paint, 2 fl oz. Please see lable for prep instructions. Some colo..
Flour. 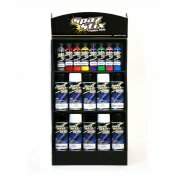 Electric Blue, Airbrush Lexan Paint, 2 fl oz. Flour. Electric Blue, Airbrush Lexan Paint, 2 fl oz. Please see lable for prep instructions. Some..
Flour. Green, Airbrush Lexan Paint, 2 fl oz. Flour. Green, Airbrush Lexan Paint, 2 fl oz. Please see lable for prep instructions. Some colors ..
Flour. Orange, Airbrush Lexan Paint, 2 fl oz. Flour. Orange, Airbrush Lexan Paint, 2 fl oz. Please see lable for prep instructions. Some colors..
Flour. Purple, Airbrush Lexan Paint, 2 fl oz. Flour. Purple, Airbrush Lexan Paint, 2 fl oz. Please see lable for prep instructions. Some colors..
Flour. Yellow, Airbrush Lexan Paint, 2 fl oz. Flour. Yellow, Airbrush Lexan Paint, 2 fl oz. Please see lable for prep instructions. Some colors.. This is some old stock of the Original Pactra Racing Finish for R/C Cars. Use with lexan/polycarbona..
Silver Metallic, Airbrush Lexan Paint, 2 fl oz. Silver Metallic, Airbrush Lexan Paint, 2 fl oz. Please see lable for prep instructions. Some colo.. Solid Blue, Airbrush Lexan Paint, 2 fl oz. Solid Blue, Airbrush Lexan Paint, 2 fl oz. Please see lable for prep instructions. Some colors ma.. Solid Green, Airbrush Lexan Paint, 2 fl oz. Solid Green, Airbrush Lexan Paint, 2 fl oz. Please see lable for prep instructions. Some colors m.. Solid Orange, Airbrush Lexan Paint, 2 fl oz. Solid Orange, Airbrush Lexan Paint, 2 fl oz. Please see lable for prep instructions. Some colors .. Solid Pink, Airbrush Lexan Paint, 2 fl oz. Solid Pink, Airbrush Lexan Paint, 2 fl oz. Please see lable for prep instructions. Some colors ma.. Solid Red, Airbrush Lexan Paint, 2 fl oz. Solid Red, Airbrush Lexan Paint, 2 fl oz. Please see lable for prep instructions. Some colors may.. Solid White, Airbrush Lexan Paint, 2 fl oz. Solid White, Airbrush Lexan Paint, 2 fl oz. Please see lable for prep instructions. Some colors m.. Solid Yellow, Airbrush Lexan Paint, 2 fl oz. Solid Yellow, Airbrush Lexan Paint, 2 fl oz. Please see lable for prep instructions. Some colors ..
Spaz Stix Ultimate Black Backer. For Backing Ultimate Chrome. ..
Spaz Stix Ultimate Mirror Chrome - Spray 3.5 fl oz. Must Use Ultimate Black Backer ( 10209 ) For Be..